I came to Booth to start a successful and sustainable social enterprise that helps people gain access to opportunity. When I sat down with Nakul Gupta to talk about MyMBACircle.com I thought I was gathering information that would help me launch an undergraduate career coaching venture, but after our conversation it was clear that we were working on similar problems from different starting points. I instantly connected with MyMBACircle’s mission of democratizing admission support to the top business schools through mentoring and bite-sized services. Core to the company’s mission is the belief that neither finances nor personal network should limit access to insights and knowledge that support candidates in gaining acceptance to top MBA programs and accessing all of the opportunities that comes with that acceptance. Nakul and Juan Pablo (both second-year students at Booth) had built, tested and successfully launched the platform, garnering positive feedback from many candidates who loved the honest and transparent mentoring experience. Walking through MyMBACircle.com as if I were a prospective student, I saw just how easy it was for anyone to gain access to MBA application support. The bite-sized services and the pricing are clear and affordable, offering candidates the ability to bundle various services as they progress through the MBA application process for a fraction of the cost of traditional admissions consultants. Through the website, candidates are able to make a genuine connection with a mentor. Candidates select the mentor they want to connect with and schedule an appointment through the website. MyMBACircle mentors are current students or alumni of top business schools and represent multiple industries and functions across companies. These mentors are able to guide candidates through the MBA application process and work with candidates to better tell their stories in the context of the schools they are applying to. MyMBACircle also provides immense value to candidates through additional materials with each service selected. “I feel that there is a big unmet need for such mentorship for aspiring candidates and I am excited to be a mentor and growth lead for Canada on the platform” – Dallas Cullen, a second-year Boothie. We are continuing to build a user-friendly mission-driven platform, and already see a strong connection forming between candidates and their mentors. I’m excited to be a partner in MyMBACircle’s growth and work towards achieving our mission. We would love if you can help us spread the positive word. If you know anyone who could benefit from using this platform please send them our way! 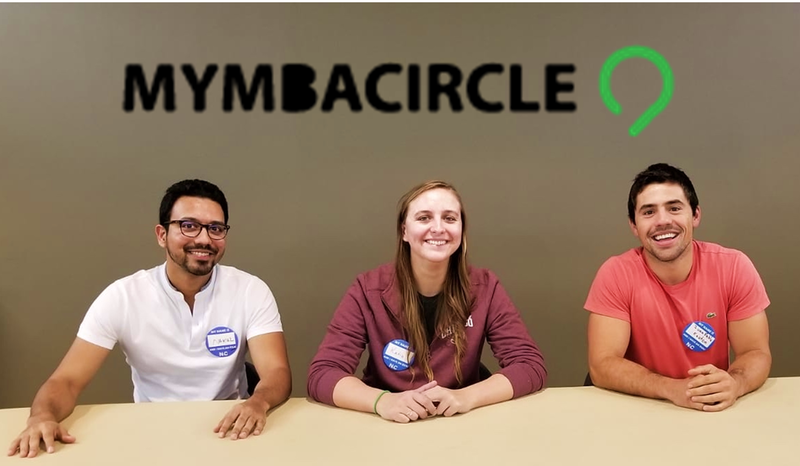 Also if you have questions (or are interested in joining our team for NVC) you can reach Nakul Gupta, Juan Pablo, or Katie Orovecz at admin@mymbacircle.com. This is just the start for us as we hope to achieve success in the MBA market and provide honest, bite-size mentoring services for every stage of an individual’s career.